Have you noticed that it’s far less expensive per pound to buy a whole watermelon than it is to buy a cut piece? With two people in our house, a piece is all I really need, but a whole watermelon on sale is hard to resist. Much of my latest melon bargain was consumed in chunks, but we also drank one batch of watermelon margaritas and I made this delicious Watermelon Sorbetto from The Perfect Scoop. I skipped the chocolate chips – aren’t most watermelons these days seedless anyway? Thank you David Lebovitz for this delicious scoop of summer, and thank you Jessica of Cookbookhabit for sending me a copy of the book! I won her giveaway and wanted to make the same recipe she did. I’m looking forward to seeing what other recipes she churns up this summer. If you have a favorite from The Perfect Scoop, let me know! If you want to do a trial run of the book, see if it’s at your library (mine has a copy!). You can also find the recipe here on Google Books. So glad you tried this sorbetto – so refreshing! Although I think watermelon margaritas sound soooooo good right now (and it’s only 8:30 a.m.). Can’t wait to try more from TPS! I always buy the whole watermelons because they’re definitely cheaper. I’m the only person in the house eating it, but I don’t mind 🙂 I can’t wait to try this recipe, it sounds amazing! We’ve tried and loved most of the chocolate recipes from TPS – there’s a chocolate peanut butter ice cream we really love and it’s super simple with just a few ingredients stirred together and no eggs to temper. Oh WOW-that looks refreshing!!!!! Gotta get my hands on a copy of that book! So beautiful! I haven’t made this one, so will get to that asap…and what a great idea to leave those chocolate chips out so I don’t have to spit them out like watermelon seeds, right? You knew I would say that, I’m sure. Your photo is gorgeous. This looks like the perfect summer treat Jill. It annoys me how cut fruit and veg is more expensive than the whole, but I often just can’t use a whole melon or pumpkin – grr. That looks so delightfully refreshing! I often get tempted to buy things in bulk because it seems to be a better deal and Josh has to remind me that we will have trouble finishing it. I love TPS! I think my favorite has to be the raspberry ice cream. What a pretty sorbetto! And a great way to use watermelon. Congratulations on the cookbook win! 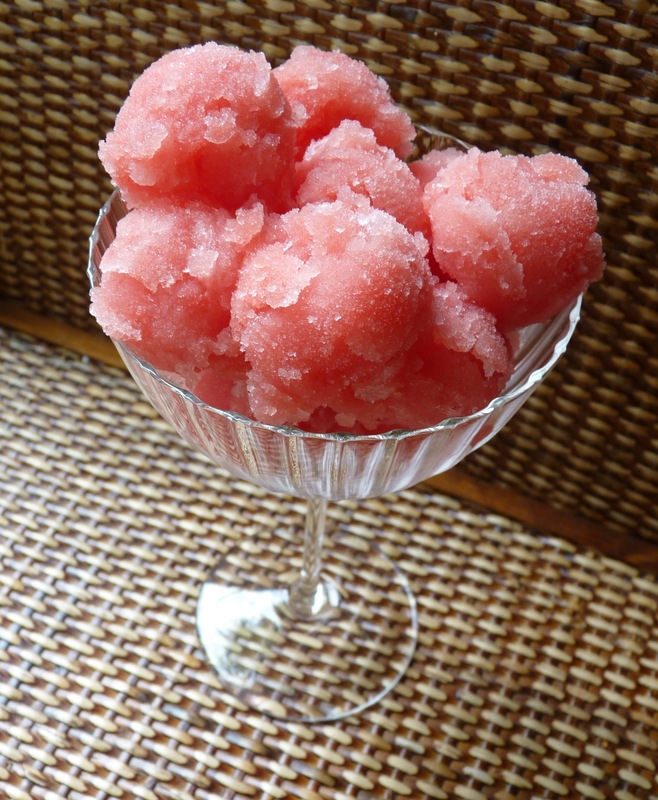 Watermelon margaritas and sorbetto?! I’m coming to your house for a treat! I love the sorbetto recipe, Jill, and will have to give it a try. You’re right about buying watermelon, even if you don’t use it all, it makes for good compost. Happy summer!